Need to add a fast, fun and delicious snack for your guests? Try our Nacho Cheese Warmer for your next San Diego event. Nachos are inexpensive, easy to make and best of all: Delicious! 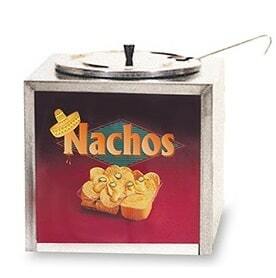 Our commercial Nacho Cheese Warmer is perfect for keeping your nacho cheese hot and ready to serve. Add some chips (and maybe some jalapenos if you are daring) and you'll have a snack all your guests will be raving about! Includes 1 - 48 serving can of cheese sauce. Warmer requires 90 minutes to heat cheese. Chips and Chip trays are not included. Minimum space: 1'L x 1'W x 1'H.